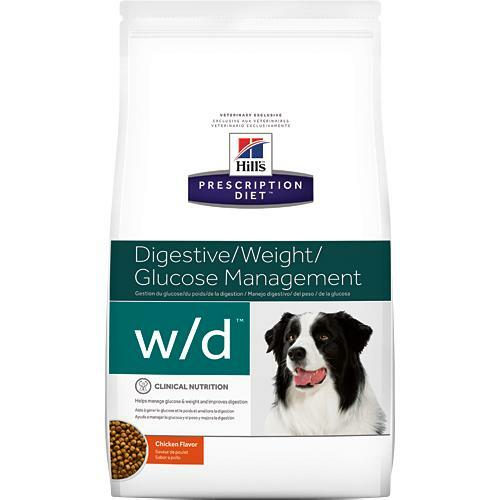 Prescription Diet Canine w/d has the following key benefits. New great taste your dog will enjoy. With Chicken (minimum 16%): Ground maize, cellulose, chicken and turkey meal, maize gluten meal, pea bran meal, digest, dried beet pulp, animal fat, flaxseed, vegetable oil, potassium citrate, salt, L-lysine hydrochloride, L-carnitine supplement, ground rice, potassium chloride, taurine, L-tryptophan, vitamins and trace elements. Contains EU approved antioxidant. Beta-carotene 1.5 mg/kg, Calcium 0.006, Carbohydrate (NFE) 0.478, Fat 0.083, Fibre (crude) 0.143, L-Carnitine 325 mg/kg, Magnesium 0.0009, Moisture 0.08, Omega-3 fatty acids 0.0044, Omega-6 fatty acids 0.025, Phosphorus 0.005, Potassium 0.0063, Protein 0.174, Sodium 0.0024, Starch 0.385, Total sugars 0.011, Vitamin A 11600 IU/kg, Vitamin C 70 mg/kg, Vitamin D 470 IU/kg, Vitamin E 600 mg/kg.